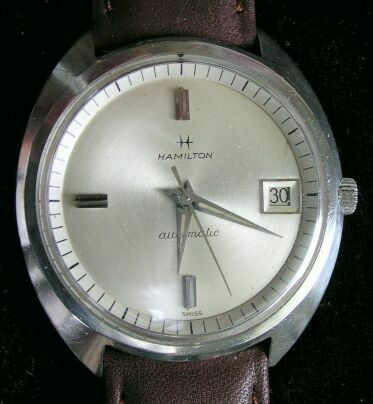 HAMILTON "694" date feature, automatic watch. It has a dial that is, but for one scratch at the "2" position, in original excellent shape. 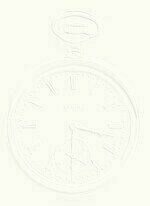 Dial is white, hands and hour markers are silver colored. Signed crown. 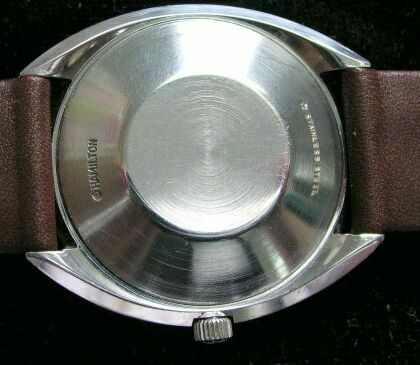 The case is a one piece stainless steel case in excellent shape, the crystal has been replaced as well as the strap. The case is #RO38XXX/Star W.C.Co. The movement is Swiss Made, it has been cleaned and adjusted and worn to check the accuracy. It has a lifetime mainspring. Case 34 mm lugs 18 mm. # 1167 $ 149.00 + shipping.